Sydney-based artist and curator Roslyn Helper has enterprisingly initiated an online gallery, New Physics, promising a series of exhibitions which open with extant works by Joe Hamilton, Alrey Batol, Josh Harle and Louise Zhang alongside works altered for an online context by Kusum Normoyle and Holly Childs and Stephanie Overs. Also featured are an ongoing work by Giselle Stanborough and commissioned creations by Ellen Formby and Peter Wildman. Stanborough’s unfolding Instagram work is a series of often droll collages frequently connected by a pricked thumb motif, suggesting vulnerability, magic and blood sugar level checking, and including a striking visual prayer for the injured Red Cadeaux along with a lament for the many race horses who die or are killed prematurely. Alrey Batol's lightly interactive Clearance amusingly mocks the accumulation of everyday goods from phones to espresso machines in the form of a calculatedly irritating computer game. A more disturbing delirium is induced by Joe Hamilton’s beautiful indirect.flights with its mobile collaging of surfaces natural and synthetic, thick paint, Google Maps and snippets of equally hard to place functional sounds. Peter Wildman’s code poetry is quietly multi-voiced over images of open mouths in which appear fragments of code and text with some witty outcomes within an overarching sense of delicate reflection on life and love. To enjoy Josh Harle and Louise Zhang’s fascinating interactive sensory blend of animation and sculpture, Blobs, you’ll need to spend $0.99 for the app. A panel of six performances on video by vocal noise artist Kusum Nomoyle are activated by hovering the cursor over an image and clicking (it’s no good trying to hit Play or Pause) which also introduces degrees of colourisation into the industrial landscape in which the artist vigorously performs. There are more works to embrace—and without the stiff backs that ‘real’ galleries so often induce. Roslyn Helper brings to the task experience in curating exhibitions and events for ISEA (2013), This in Not Art (2013), Vivid Ideas (2014) and the Brisbane Powerhouse (2015). She is the current Artistic Director of Electrofringe. Helper’s interest in the effects of new technologies on society, culture and politics is reflected in her degrees: BA (Media Communications), University of Sydney and MA in Arts Politics from Tisch School of the Arts, New York University. An Australian online gallery focused on the themes that preoccupy her is an important innovation. 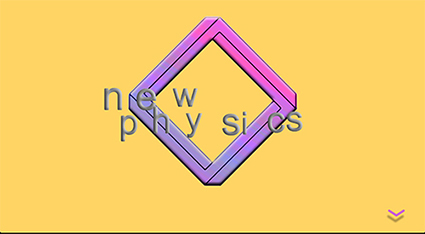 How did the New Physics come about and how do you envisage it? It came about as an independent, self-funded project, the first iteration of a series of curatorial experiments presenting online art. I'm not thinking of it as an online representation of a traditional gallery, but rather a new type of gallery: an entry + exit point / a distribution channel—a platform that caters appropriately to the artforms it presents. A URL can travel, relocate and decontextualise itself in the way that a room cannot. The other thing to note with curating New Physics is that my approach inverts the traditional curatorial processes. Usually you start with a physical space and fit the artworks into it. In this instance, I found/commissioned the artworks first, and then designed a space around them. What kind of work attracts you? I'm not interested in a particular ‘style’ of online art. I think the beauty of the internet is that it presents such a plurality of perspectives. Rather, I'm attracted to art with a critical or conceptually rigorous underpinning: these works all play with familiar social, political and economic functions to examine and challenge the ways we think about and approach the ubiquitous online experience. What kind of works will you curate and exhibit? A combination of extant, reworked and commissioned pieces to create a more sophisticated art experience that properly caters to the net environment. A variety of online media have been chosen: website, game, app, instagram, video etc. Internet culture has no aesthetic cohesion or unifying politic. Rather, the selected works present a diversity/plurality of perspectives that utilise, represent, satirise and disrupt online systems. The New Physics catalogue essay illustrates the socio-political context that situates the exhibition and describes more fully the concepts behind each artwork.